Perhaps the most recognizable vehicle in the automotive industry today, the 2013 Jeep Wrangler continues a history of unique body design and off-road excellence. The JK platform is still being used for the 2013 Jeep Wrangler, after debuting with the 2007 model. It comes in the standard short-base two-door version and the long wheelbase four-door model. The 2013 Jeep Wrangler breaks no molds and sets no barriers. It offers only what it has always offered - simple, straightforward functionality. Power is adequate, as has been the case for many generations of Wrangler now, and it maintains its stature as an off-road trendsetter. For those enthusiasts who crave the adventure trail, the 2013 Jeep Wrangler is still one of the best. "Despite major improvements to its interior over the years, this Jeep remains a limited-purpose machine. Off road, it's a finely honed tool. On road, it's best considered a fun-in-the-sun runabout." (Consumer Guide) Experts love the visibility and power of the Wrangler, but complain of its ride on the road and basic utilitarian interior. The 2013 Jeep Wrangler comes in three different trim levels as well as three separate model levels. It is available as both a two-door and four-door version, as well as a very nice Unlimited version. All three of those models are available in three different trim levels - Sport, Sahara, and Rubicon. Each of these models and trims provide its own unique abilities, and the technology of the Wrangler has definitely come a long way in 26 years. The first trim level is the Sport class. This comes with most of the standard Wrangler features, such as front and rear tow hooks, foglamps, cruise control, a removable soft top, and a six-speaker sound system with CD player and auxiliary audio jack. Even though the Wrangler remains a classic of off-road ability, it has managed to step into the 21st century in many aspects and now even offers steering wheel radio controls on even the base Sport class. If you should opt for the Unlimited model of the Sport class you'll also receive a larger gas tank, four doors instead of two, air conditioning, and additional trunk space. There is an available Convenience package that adds power accessories, heated power mirrors, and keyless entry. The Sahara trim level adds 18-inch alloy wheels, an upgraded suspension, side steps, fender flares, and an Alpine sound system. The Rubicon is the top-of-the-line when it comes to the Wrangler options. It features special 17-inch wheels, 32-inch tires, heavy-duty axles and transfer case, electronic front and rear locking differentials, a disconnecting front sway bar, rock rails, air-conditioning, a leather-wrapped steering wheel and satellite radio. Although it is much more technological than its ancestors, there is no denying the priority of function over comfort in the cabin of the 2013 Jeep Wrangler. There are some padded surfaces but most of the cabin is made of hard, rigid plastics and sharp corners. The cockpit features a four-gauge panel with two main gauges and two smaller gauges just outside of them. The center console is about as basic as it gets. Buttons and knobs are all clear and well placed. Contrary to popular belief, the cabin is actually quiet. There is ample headroom and leg room, but don't expect a great deal of comfort from the seats; they are firm and lack support in the lumbar areas. Of course, we're talking about the front seats here. If you opt for the two-door Wrangler you won't get much in the way of comfort from the rear seats in any aspect. The four-door is much better in the way of roominess but the seats remain firm and unsupportive. The two-door Wrangler manages 17.2 cubic feet of cargo space behind the rear seats or 55 cubes with the rear seat folded. The usefulness of the cargo space is curiously ponderable though as the rear seat does remove but it is both heavy and cumbersome. Folding it down really only improves space if you're hauling large objects, as it doesn't lay totally flat. The four-door version offers 31.5 cubic feet with the rear seats up and 70.6 folded forward. 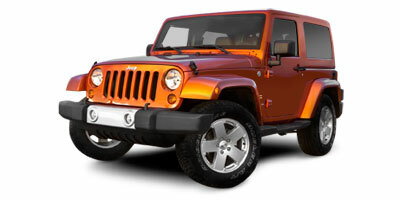 The 2013 Wrangler comes standard with a 3.6L V6 that pushes out 258 horsepower and 260 ft.-lbs. of torque. Four-wheel drive is also standard, as is high- and low-range transfer case gears (though the Rubicon adds an extra-low gear to the upgraded transfer case it offers). The V6 engine comes coupled to a six-speed manual transmission with hill-start assist, though you can opt for a five-speed automatic if you so choose. The EPA estimates fuel economy at 17/21 mpg (city/highway) with a slight drop for the Unlimited model. But honestly, who really buys a Wrangler for the fuel economy? Let's get to what Wrangler lovers really want to know. As with all of its predecessors, the 2013 Jeep Wrangler is a chiseled performance machine when it comes to off-roading. Power is ample and the ride remains rugged over a rocky trail. There is quite a bit of body lean on hard corners, but the steering is so slow to respond that it may be difficult to get it into a sharp turn to begin with. The suspension reacts well to the rugged terrain but leaves something to be desired on the open road. Braking power is the one major weakness on this year's model. The pedal feels soft and the Wrangler is slow to respond. It's fair to say there are still some kinks to be ironed out in future years. Don't expect the scores to be off the chart here; but again, most consumers aren't going into a Wrangler purchase with the idea of getting a secure family traveler. The side doors of the Wrangler are not built for protection in the event of a side collision. Needless to say, this poses quite the red flag to crash testers. Without side airbags, the two-door Wrangler earned an IIHS score of Poor, while the four-door received only a step up from that at Marginal. It did earn a top mark of Good, however, in frontal-offset crash tests. There are currently no major recalls but reliability is only average. Some issues that Wranglers have seen in the past few years include problems with steering components, interior switch malfunctions, and a knocking noise from the undercarriage. The 2013 Wrangler comes with the standard 3-year/36,000-mile manufacturer's warranty, along with the 5-year/60,000-mile powertrain warranty. MSRP ranges from $22,195 for the base model two-door, all the way to $34,095 for the Unlimited Rubicon. Interested to see how the 2013 Jeep Wrangler ranks against similar cars in terms of key attributes? Here are the 2013 Jeep Wrangler rankings for MPG, horsepower, torque, leg room, head room, shoulder room, hip room and so forth.